Had a somewhat surprisingly good chase out to eastern Wyoming and western Nebraska. 2018 has been a big time down year for good storms and tornadoes, but we managed to get everything from great structure, big hail, a landspout tornado and a heck of a lightning show this day. I probably would not have chased if my friends Kevin and Kate were not out on their chasecation and I could meet up with them in Wyoming. I left the day before and drove out to Rapid City, South Dakota, then down to the target area near Cheyenne, Wyoming the next day. We watched a short-lived supercell with terrific structure go up on the Laramie Range north of Cheyenne, but this storm quickly went outflow dominant with a surging boundary and cold front undercutting all the storms. This was obviously the end to any decent thunderstorm threat that we had, so the decision was made to book it to the east towards storms developing in northeast Colorado and moving up towards Sydney, Nebraska. Storms went to the north into an area of bad roads and into more stable air, but one storm caught our eye southwest of Ogallala, Nebraska. We got ahead of this storm and almost decided to bail and head north to get on a storm approaching Arthur, Nebraska, but the storm to our southwest strengthened and started to look much better as it got into higher dewpoints and better CAPE. Ended up chasing this storm from Ogallala to Wallace, Nebraska, seeing some good structure, a wall cloud, funnel, rainbow with lightning, a landspout tornado and an incredible lightning show to end the day. Definitely worth the 1800+ miles that I drove on this trip, even for 1 day! 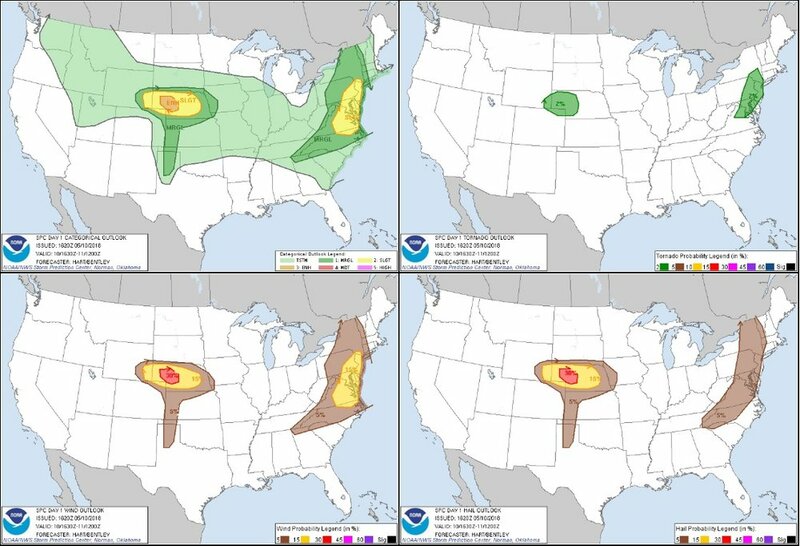 Drove back home the day after as the setup for the next few days did not look appealing to chase. Beautiful supercell with foot shaped lowering and great structure moving off the Laramie Range to the north of Cheyenne, Wyoming. 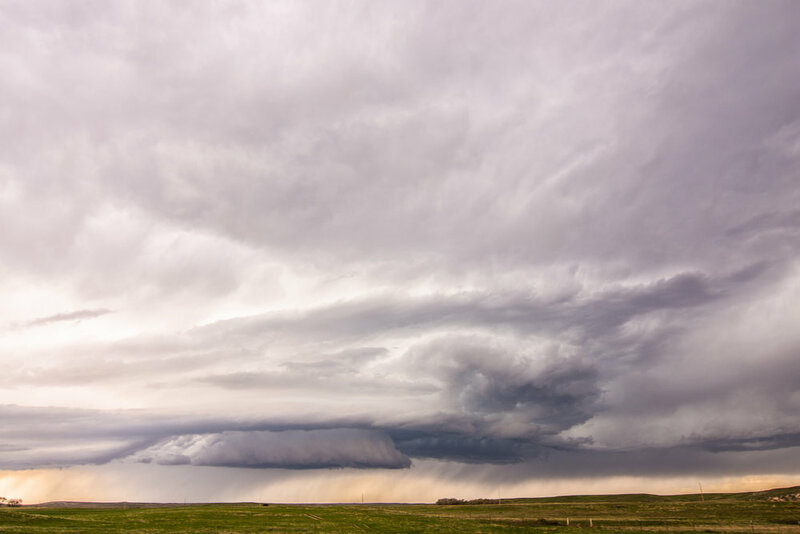 Wide angle, zoomed out view of the entire rotating supercell moving off the Laramie Range into the high plains of Wyoming. You can really see the inflow being pulled in with the bands from left to right and rising, corkscrew motion into the storm updraft. Caught a photo of a train going by while watching the storm east of Ogallala, Nebraska. Thought it was kind of a cool photo, especially since you can see the storm in the background through the train. Kevin and Kate enjoying the chase and watching the mesocyclone directly ahead of us north of Madrid, Nebraska. Short lived funnel cloud on the storm north of Elsie, Nebraska. Wall cloud north of Elsie, Nebraska. View from the east as the mesocyclone was moving towards us down the road. Got into some big hail north of Elsie, Nebraska! This was after 15 minutes of melting. Around golf ball size hail initially. Awesome shot of a rainbow and lightning in nearly the same orientation northwest of Wallace, Nebraska! This was looking to the east at the back side of the storm. Landspout tornado! We came around a bend in the road and saw a large dirt plume. 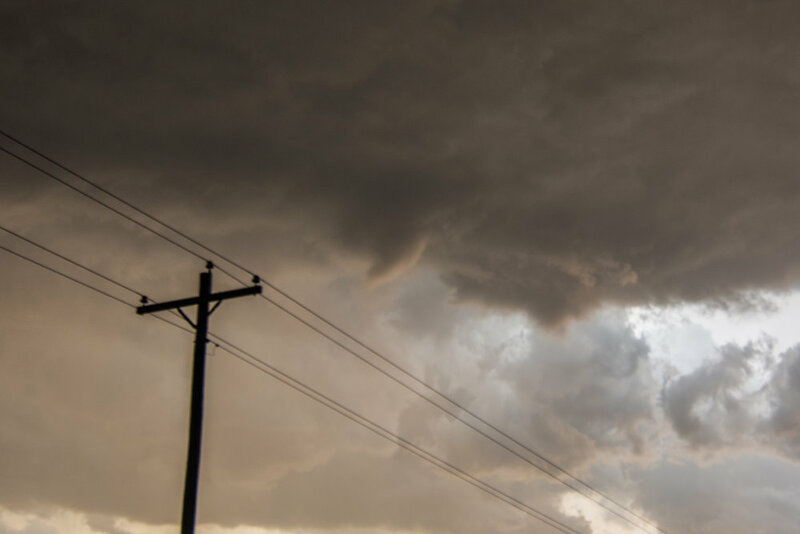 No condensation funnel above but was rapidly rotating and swirling with dirt directly underneath the mesocyclone. Very cool site to an already good chase day. Another shot of the landspout tornado with lightning. Lots of dirt being kicked up at this point. Last moments of daylight here, or we would have never been able to see it clearly. Time for lightning shots. 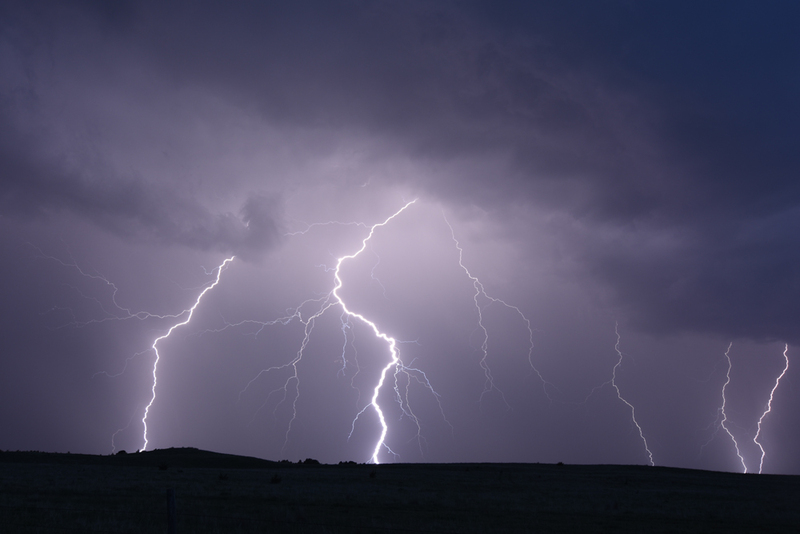 I really like how these bolts took on a similar shape, north of Wallace, Nebraska. Bolts, bolts, bolts, everywhere! This was on a 30 second exposure. 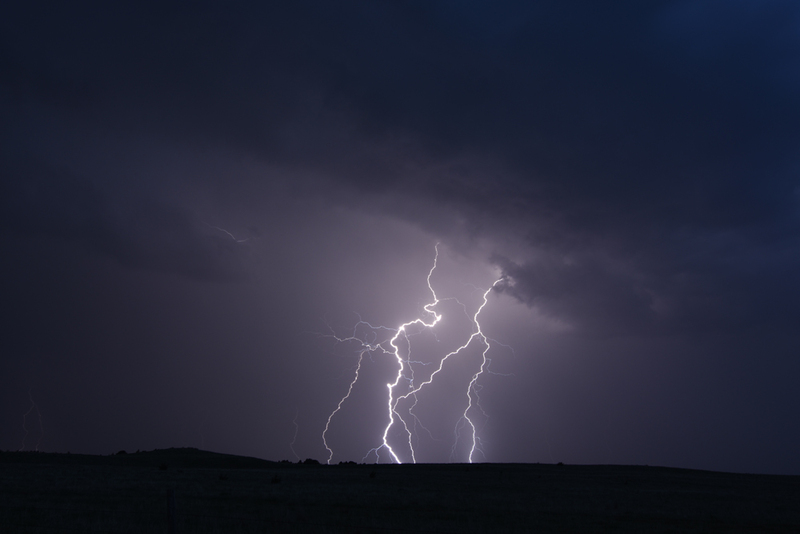 Lots of cloud to ground lightning as the storm remained severe. Lightning snaking across the sky. Mesoscale discussion issued at 12:56 PM MDT, highlighting the need for a watch box to be issued soon. Storms expected to develop quickly in an environment characterized by 40 knots of effective bulk shear and 1,000 j/kg of MUCAPE. Severe thunderstorm watch issued at 1:40 PM MDT by SPC for southeast Wyoming and western Nebraska, mainly for the risk of large hail and damaging winds. A new mesoscale discussion issued at 5:10 PM MDT, highlighting the continued severe weather threat. Effective bulk shear has now increased to around 50 knots with 2,000 j/kg of MUCAPE into western Nebraska. Mesoscale discussion issued at 7:39 PM CDT highlighting the need for another watch box soon, especially for damaging winds. Effective bulk shear continues to increase to 55-65 knots into the area. New severe thunderstorm watch issued at 8:00 PM CDT for severe storms with damaging wind potential into the evening.